Life-Mate Car Roof Cargo Carrier Protective Mat Anti Slip Roof Rack Pad with Extra Padding for Cargo Storage Bags Roof Top Carriers. A. When you load cargo on your cars roof rack? B. Do you fear the unsightly scratches or dents on your car top? C. Are you unhappy when paying for the expensive repainting job? D. Apparently you will be depressed when the top cargo shift or slip even damage after falling down. 1.Use our thick MUTI-PURPOSE MAT to prevent damage from roof cargo carriers. 2.Rubberized mat helps prevent cargo shift and slippage during transit. 3.36"x 39"pad can be cut to fit, or folded for additional protection. 4.Use with all rooftop cargo carriers, bike racks, luggage carriers,etc. 5.Use with cars, trucks, or vans. Interior or exterior. 6.Purchase extras for larger spaces or multiple vehicles. 3. Life-Mate：100% Money back guarantee! 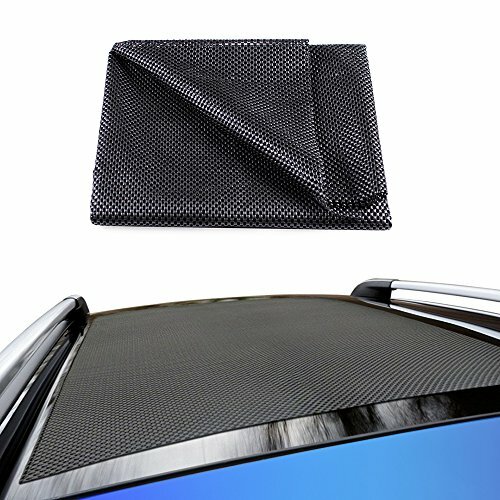 CAR ROOF PROTECTION: Heavy Duty protective pad layer between car top and roof carrier fits neatly and protects against scratches and gouges during travel. ideal for cargo bags, car top carriers, racks, Xmas trees, surfboards, bikes, etc. ANTI-SLIP: Webbing design provided extra padded grip on both side to prevent slipping. ensure the non-slip mat and the roof carrier or sharp objects in place, even in a high speed. TRIM TO FIT: the universal size 36" x 39" can be cut to fit your car roof or cargo, no matter you have a sedan; SUV, truck, or a larger vehicle. But remember, once you cut, you can't go back. MUTI-PURPOSE MAT: can be used in a truck bed or in any truck or cargo space or on a roof to help prevent load shift. Also great for non-slip carpet or can be used in kitchen to open jar. 100% MONEY-BACK SATISFACTION GUARANTEED: If you have problems, just contact us. And we'll refund every penny you paid (Or replace it for you immediately). If you have any questions about this product by Life-Mate, contact us by completing and submitting the form below. If you are looking for a specif part number, please include it with your message. Rhino Rack 43206 Vortex Aero Cable Core Lockdowns, 47"